A. You must be a resident of Houston County to apply with this county. B. Please be sure to use your legal name. Your name on the bond and application must match your drivers license; so if you have a middle name on your drivers license, it must be included (or at least the middle initial). C. Do not use initials for both first and middle name. D. Please be sure that your signature is legible - we must be able to verify name. F. If you are currently a notary and are just renewing, you are not required to have three people sign with you. G. If you have any questions please call 334-677-4723. A. The Notary Bond must be in the amount of $25,000.00. B. Please be sure that your name is the same on the bond, application and signature as it is on your Drivers License. A. The application must accompany the bond to the recording office. B. The recording fee is $35.00. 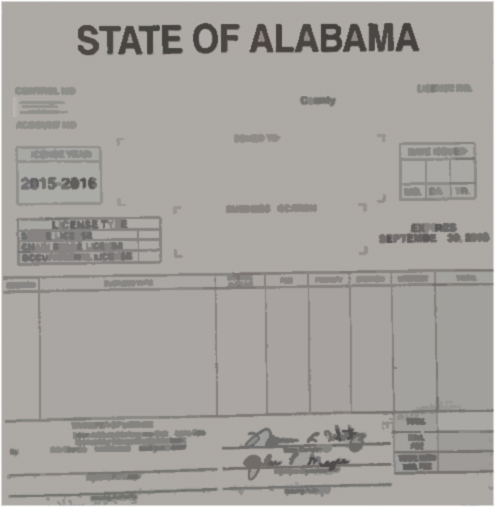 C. Once recorded, your commission will start - it will be 4 years from the date shown on the bond. A. Your Notary Seal can be obtained from most office supply companies. B. Please be sure your name is the same on the seal as it is on the application and bond. A. Once recorded, you will be mailed your Notary Certificate and Notary Identification Card. B. Please look over these items and be sure your name is correct. A. A reminder is not sent from our office to renew your notary. B. It is the same process to renew - except for the 3 signatures not being necessary on the application (unless you have expired).